Socialization is an absolute necessity. 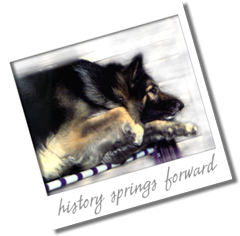 It plays a critical role in the emotional development of your Shiloh Shepherd. Properly socializing your puppy requires a concentrated effort on a daily basis, right from the beginning. Please expect to make this a priority for the first year of your Shiloh's life. If you have any doubts, please discuss them with the breeder you have selected. When choosing a puppy, please be honest and advise your breeder of any limitations you may have. Perhaps you live in a secluded area, where it is difficult to find ideal exposure for proper socializing. Possibly you are away from home for several hours each week due to a heavy work schedule. Be truthful about any health conditions which may restrict your own activity level, or limit your ability to provide your puppy with frequent walks or outdoor exercise. These are all factors which will reflect on your puppy's behavior. Providing this information will assist your breeder to select the best puppy for you. Or the breeder may suggest considering a pre-trained young adult or a retired breeding dog as a preferable alternative. Picking the Shiloh that is best suited to your lifestyle is imperative. Color, age and conformation are all secondary elements at this point. When you consider socialization, be sure to remember that a puppy or a dog is learning all the time. Each time this particular Shiloh is exposed to a new situation, it will stimulate a reaction. It is up to the owner to be prepared each and every time to shape the response into one which is desirable. For every experience a puppy is subjected to, it becomes a building block in the foundation of their future. Whenever a similar situation is repeated, the dog will react in a more pronounced manner. Eventually, you may have a series of building blocks which will lay a firm and solid basis for your Shiloh's disposition. Overall, this should be a positive outline that will insure the outcome of a well behaved canine citizen. However, should the owner fail to provide effective guidance in these situations, it might easily mislead your puppy/dog in the wrong direction. Dogs raised in a kennel environment lack social skills and are unprepared to deal with every day reality. Only the most experienced owners will have success rehabilitating dogs having spent months or years in isolation. Always be alert to your puppy/dog's comfort zone...for example; maybe you are taking your new Shiloh to your child's school bus stop - great idea! Even better, you are performing this routine both morning and afternoon. However, please be prepared for the children that will be instantly drawn to your Shiloh as they may approach in a hurried fashion and surround you puppy/dog with ear piercing squeals of delight. Many children will be tempted by a strong temptation to touch... but at the very last second, they will be overcome with doubt and swiftly withdraw their advances, and they might even scream in their excitement. This is very confusing, to say the least, to any puppy/dog attempting to accomplish the appropriate social skills to accommodate the potential bond of both canine and children. Be sure to have extra tasty treats to pass over to the children to reward your dog. Allow your Shiloh to deal with the situation while you guide with praise. Many dogs will be delighted with the appealing attention. Be observant. It is not unusual for a puppy/dog to be intimidated for the first few minutes, but do not panic by utilizing restraint. Remain upbeat and welcoming to the children's advances, rewarding your Shiloh repeatedly for holding ground and gently accepting additional treats from each encounter with several children. Gradually, over the course of days your Shiloh should become more confident. It won't be long before it is evident that your Shiloh is naturally drawn to children, as it covers a large portion of their inherited instinct. Never cease to be alert to any indications of fear; such as ears lowered against the head, general cowering, visible trembling, whining, submissive urination, tail tucking, hackles rising, growling, baring teeth or barking & lunging. It is YOUR job as "pack leader" to protect your Shiloh from a child who is overbearing! Strongly instruct the children to sit down and try to place the puppy, one at a time, in their lap for petting, praise and treats. Or lure the older puppy or adult dog into a down position beside the children. If you fail by allowing children to manhandle or tease your puppy/dog, your Shiloh will no longer trust you to protect him/her and their survival mode may be activated which quickly triggers defense mechanisms. Frequently, the owner unknowingly contributes to such a problem by trying to offer verbal or physical reassurances - WRONG! This will only reinforce a fearful reaction. Do not utilize a tight leash in effort to restrain your Shiloh, this will make him/her feel trapped and increase the already anxious response. If your Shiloh exhibits a lack of confidence you should contact your breeder for personal advice and seek a suitable training program in your area without delay. Under positive training methods, you will find your Shiloh responds readily. Never ignore a red flag or warning - the building blocks of your dog's foundation will soon become as solid as a brick wall. It is YOUR responsibility to insure that this wall is one of relative confidence, social enjoyment, polite tolerance, responsive and respective obedience. Guide your Shiloh to develop their natural maternal or paternal instincts which enable them to discriminate between a true threat verses the weak or innocent. Be aware, the time periods of the maximum benefits are between 6 weeks and 6 months. If you choose an older puppy, be certain to request and attend a temperament test evaluation presented in a strange surrounding to confirm that the breeder has provided the puppy with the proper social skills as the window for that opportunity may have already closed. An introduction to the loose lead and pleasurable walking should be accomplished between 2-3 months of age. Leash training is a vital basic exercise and is best taught early on as Shiloh's grow so rapidly. Allowing any puppy to jump, lunge or otherwise drag you around on a leash sends a strong message that you are helpless and have no control, therefore he/she is in charge. NEVER allow your puppy/dog to wrestle with another while on leash, this is a big mistake and may potentially lead to serious problems as your puppy matures. Here are some final tips on situations in which to set up for training purposes. Walks and car rides around the neighborhood, moderate to active playgrounds, waiting on the front step to meet and greet the mailman or pizza delivery boy, a visit to the local pet store to pick out a new toy, outdoor shopping centers, walks with a friendly and well trained dog after dark...checking out barn yards, livestock, wildlife, joggers, bikers, children on scooters, roller blades, skateboards, sleds or with remote control toys....public parks with sports activities such as softball, basketball, tennis, horse shows, carnivals, dog shows and/or obedience class. Also ask a familiar friend to treat your dog, leave and return wearing a floppy hat with sunglasses or a backpack with an infant, carrying a shopping bag or an overhead umbrella, pushing a stroller with a toddler, walking with a limp, or hunched over, hopping, skipping, jumping rope, or hobbling with a cane or crutches or walker, riding in a wheelchair, pushing a grocery cart, people in various types of uniforms, children of ALL ages...the list goes on and on. Please socialize your Shiloh constantly. Once a week at Puppy Class is not enough. There is no excuse for not spending a short amount of structured quality time with your dog every day. Puppies have a genetic framework that they are all born with. Be sure to thoroughly research the Shiloh Shepherd to determine this dog is well suited to your environment and lifestyle. Every breed has predictable instincts and characteristics in the center of this frame. Are you committed to your Shiloh's education? Are you ready to be a responsible guide and teach your dog to be a good companion for your family? It all begins with socialization.